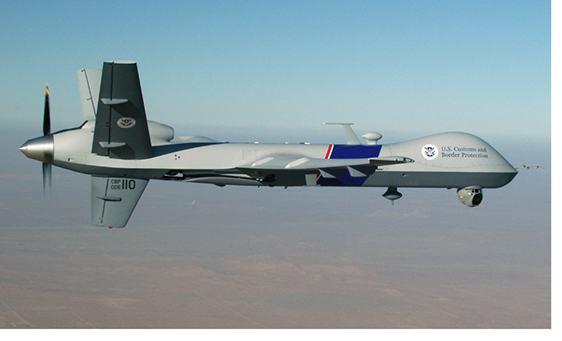 A Customs & Border Protection (CBP) report, released in response to EFF’s Freedom of Information Act lawsuit against the agency, shows CBP has considered adding weapons to its domestic Predator drones. The report, titled “Concept of Operations for CBP’s Predator B Unmanned Aircraft System” and submitted to Congress on June 29, 2010 shows that, not only is the agency planning to sharply increase the number of Predator drones it flies and the amount of surveillance it conducts by 2016 (detailed further in a separate blog post), but it has considered equipping its Predators with “non-lethal weapons designed to immobilize” targets of interest. (p. 63). However, this is the first we’ve heard of any federal agency proposing using weapons on drones flown domestically. That CBP has, without broader public discussion, considered this step—combined with the fact that the agency (with Congress’ blessing, if the immigration bill is approved (pdf, p. 92)) is planning to sharply increase the number of drones it flies—should cause serious concern for Americans. CBP needs to assure the public that it will not equip its Predators with any weapons—lethal or otherwise. Without first addressing this issue and the surveillance issues detailed in our companion blog post, the agency—and Congress—should halt the expansion of CBP’s Predator drone program.